Record players have burst back onto the music scene, providing a combination of vintage flair and progressive technology. Whether you prefer the warm, resonant sound quality, are partial to a nostalgic design, or have professional uses for a turntable, these products offer benefits to all kinds of music lovers. Audio-Technica has been manufacturing audio equipment since 1962, selling their top-quality products to professional musicians, corporate entities, and even government buildings. 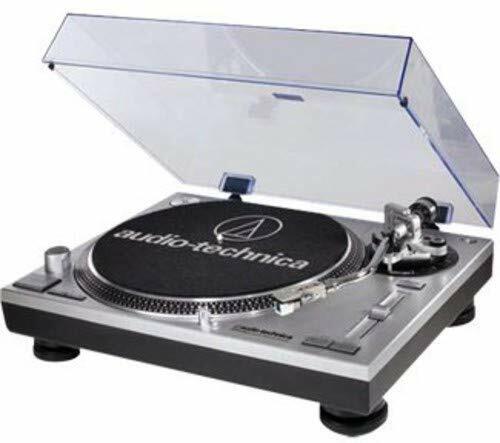 Alongside microphones and other broadcasting equipment, Audio-Technica creates world-class turntables. The Audio-Technica AT-LP120-USB is a high-end professional turntable, with a sleek design and many modern innovations. This Audio-Technica original is a favorite in the market. As you seek the best record player for you, you should know of criteria to look for in each product. Firstly, turntables are either two-speed or three-speed. Two-speed turntables accommodate 33 ⅓ and 45 RPM records, which includes both singles and EPs/albums. Three-speed turntables can accommodate an added speed of 78 RPM, which is required in order to play records made in the years before 1955 or so. Another basic characteristic of turntables is whether they operate automatically or manually. The needle of automatic players is moved onto and off of the record by pressing a button. With manual models, the user must complete these motions by hand. Modern turntables support either a belt-drive, direct-drive, or digital operation. Belt-drive systems replaced the early idler-wheel drive operation, which utilized an inefficient and unreliable rubber wheel. The rubber wheel was advanced into an elastomeric belt, which spins the record and absorbs a portion of vibration. Direct-drive systems rely solely on the power of the motor; the record is spun by the turning of the motor. Digital systems are the most progressive available, and can be incorporated into other systems. This operation normally involves volume and speed control as well as digital displays. Record players can also vary in their audio set-ups. Some products have an internal sound system, with built-in speakers or stereos. These options are highly convenient, but the projected audio may not be powerful. Other turntables require the use of an external sound system by including a connection to personal speakers, stereos, or amplifiers. While these products are not as convenient, they typically weigh less, and your personal audio devices may produce higher-quality sound than a built-in speaker would. In today’s modern times, many record players have digital music capabilities. This feature comes in two forms: the player has either a built-in USB port or a completely analog system. Turntable products with included USB ports can record the audio from your vinyl records and store the recordings as MP3 files. This allows you the benefit of record player-style audio in digital form. Fully analog players often come with a pre-installed digital music library, offering a similar perk to the USB port, but excluding the recording ability. Determine your personal needs and requirements to apply the above criteria to your turntable selection process. The AT-LP120-USB record player is an upscale product with many advanced features. The 3-speed, direct- drive turntable supports a manual operation and a high-torque motor. Also, the unique S-shaped arm comes with an adjustable counterweight, changeable tonearm height, and anti-skate alteration. The sleek design includes an aluminum platter, start/stop button, and forward/reverse play feature. Precise pitch lock and pitch alteration slider control are also featured. Ideal for DJs and other modern music lovers, the AT-LP120-USB has an extensive array of technical capabilities. A selectable internal stereo phono preamplifier allows you to connect the turntable to a personal receiver, amplifier, or any other audio component, even those without a dedicated turntable input. The included USB output allows for connection to your computer for digital conversion of the records’ audio. Mac and PC-compatible Audacity software also come with this product to further innovate the digitization process. USB and RCA output cables are included. Aimed at avid music enthusiasts and professionals, the AT-LP120-USB is a highly advanced turntable which justifies its high price with progressive, exclusive features. If you are a DJ or have other professional uses for a turntable, this model offers an ideal combination of traits, namely the built-in switchable phono preamplifier for connection to personal audio devices, and the included USB port for digital conversion of your records. The inclusion of Audacity software with this device takes it above and beyond the other models in its class. Even for those without professional needs, the AT-LP120-USB can be an attractive option. A high-performance phonograph cartridge offers outstanding clarity of sound. For purists, the manual operation will provide the personal control found in early turntable models. The 3-speed capability allows you to play any vinyl record you wish, and a cast-aluminum platter contributes to phenomenal audio projection. You don’t have to be a DJ to appreciate a top-caliber listening experience. The AT-LP120-USB is certainly a specialized device, but would not be considered one of the most affordable options available. For turntable beginners, casual listeners, or those looking for an authentic vintage product, it is not the best model to consider, due to its high level of technicality and modern design. However, for those looking for a cutting-edge device, this Audio-Technica bestseller is a great value for its price, considering the incredible variety of benefits it offers. The AT-LP120-USB turntable is ranked among the best vinyl record players for professional DJs. This model guarantees the highest quality components combined with a selection of innovative capabilities. With high ratings and the respected Audio-Technica brand behind it, the AT-LP120-USB is an impressive turntable for the experienced music consumer.